Jerry Brown didn't enjoy his CNBC interview. Arnold Schwarzenegger may have the physical muscle, but a man who wants to take his place as California governor showed he has the pipes to take on a different kind of fight. We are talking about Attorney General Jerry Brown, who got a little testy with a couple of CNBC anchors Tuesday. The interview got him so hot under the collar he wrote an op-ed piece for the Huffington Post. It begins, "If street thugs were to hold up a convenience store and drive off with $1 million, it would be national news. But when a venerable Boston bank rips off California's two largest pension funds for $56 million, it's business-as-usual - at least to the anchors of CNBC." For those who know the former Oakland mayor and California governor, both the interview and the article are classic snippets, but those new to the man and his mouth might not get it. 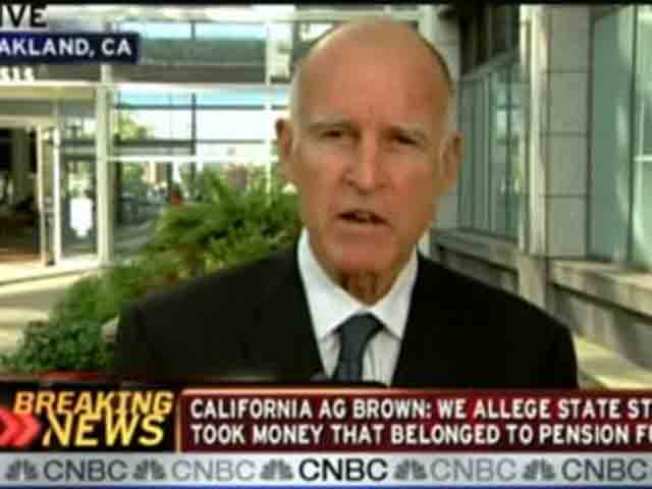 The subject was Brown's big announcement that California is suing a Boston-based bank for bilking the state's largest pension fund of millions of dollars. For the record, State Street Bank denies the claim. CNBC sent a satelitte truck to Oakland to get a one-on-one interview with Brown to discuss the broader implications of the suit. Everyone plays nice to start. Brown even answered a question whether what the bank did was illegal in the first place. Then Michelle Caruso Cabrera asked if the case was simply an example of a man wanting attention in his run for governor. That's when the sparks started to fly. Brown suggested CNBC shut the interview down if they didn't want it. Follow up questions only heightened the tension with Brown asking, "Are you pimping for the defendant in this case? I can't believe it!" The good part starts about three minutes in. There was also some East Coast vs. West Coast tension to the back and forth with Brown suggesting CNBC was showing "insensitivity and arrogance of the eastern financial elite" who did care about a $56 million loss here in California. Should be a fun election season ahead.